What tricks do you have in your bag to stay productive for extended periods of time? Some will say: single focus, no distractions, away from computers — and right into the Bronze Age. Because, let’s admit it, shutting everything down is simply not a viable solution for the modern workplace. Today, our multifaceted responsibilities require us to have multiple windows open on our Macs at all times, fending off never-ending Slack messages while writing emails and managing our calendars. Looking from the sidelines, it might seem that what we do all day is just switching between full-screen app windows. For years, our natural desire was to get more screen real estate by adding a second, third, and even fourth monitor. Numerous guides on how to do dual screen on Mac properly suggested a variety of ways in which screens could add to our working lives. In the end, portability and convenience won when most of us switched to predominantly working on our laptops. But accomplishing the same amount of work with a smaller screen got even more challenging. That all changed as Apple released its OS X El Capitan in 2015. Starting El Capitan, all versions of macOS have included a MacBook split screen feature called Split View, which lets you easily open two apps to fill the whole screen and adjust them as needed. Note: some older, not frequently updated apps might not support Split View. Feel free to experiment with various app combinations that would fit your work the best. If you need to see more than two apps, you can easily create another Split View on a new Desktop. To do that, just launch the Mission Control utility and click on the plus icon in the top-right corner of the screen. If you’re wondering how to switch screens on Mac in Split View, you can either go through the Mission Control or swipe left or right with four fingers as a shortcut. To change the portion of the screen used by each app, simply drag the divider in the center to either side. To quit Split View, either press Escape, the same green “full-screen” button, or use a shortcut Ctrl + ⌘ + F.
The Split View Mac provides by default is arguably twice as good as using just one app at a time. But it doesn’t go beyond that. What about four, six, or eight times the productivity? Alas, the Split View can’t give us that — it’s only up to third-party utilities to fix. Mosaic is a Split View Mac alternative and most likely the last window manager you’ll ever need. Unlike Split View, Mosaic supports any kind of layout arrangement, whether you want to divide your screen in rows, squares, columns, or a completely custom grid. You can also create new Mac split screen configurations by clicking on the Mosaic menu bar icon and then Preferences ➙ Quick Layout. With Mosaic you can customize your screen to fit your needs precisely and thus considerably increase your productivity. As a bonus, when you find the original Mac split screen not working or being unresponsive, Mosaic can be the answer, as it’s based on a third-party technology and is compatible with all apps. While using Mosaic as a better Split View Mac alternative will help you keep all the app windows in place, reopening every app and file you need for your work can take lots of time. Switchem is an automated solution that lets you create preset workspaces for all major activities. For example, if you’re about to code something, you can get Switchem to open your text editor, FTP transfer app, Terminal, your framework of choice documentation in Chrome, and anything else you regularly use. With Switchem, you can create as many workspaces as you like and switch between them with ease. To activate a workspace, simply choose it from the menu bar icon or use a shortcut. To create a new workspace in Switchem, click on the Switchem menu bar icon and choose Create New Group. Then simply activate any app or open any file you need for them to appear in the list and check the boxes next to them. When you’re done, select Create New Group. Just like that you can compartmentalize all your work into categories and open all the materials you need in one click. The Split View Mac supplies by default is a definite boost to your productivity in the today’s work environment. However, if you need more flexibility in how precisely you configure the app window arrangement, look no further than Mosaic. In addition, combine everything you need into detailed packages and call on them at any time using Switchem. This way you can easily divide responsibilities or separate work from personal life. Most importantly, you stop wasting time on opening all the right documents and turn on the always “ready to go” state. 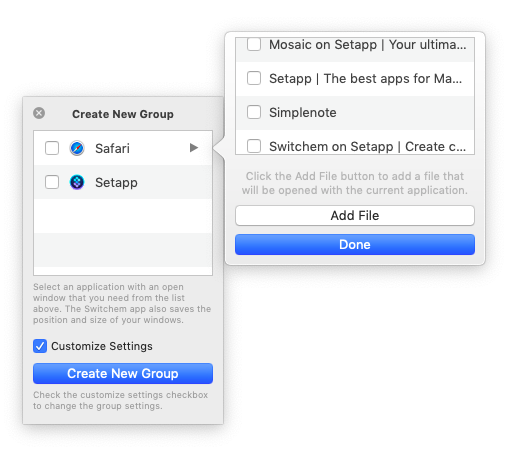 Best of all, both Mosaic and Switchem are available for a free trial through Setapp, a platform of more than 130 Mac apps that cover productivity, task management, creativity, and more. Arm yourself with the utilities you need to go through your day in the productive state of flow.